To commemorate Mega Man's 30th anniversary, Kotobukiya have announced that they will re-release all four 1/10th scale Mega Man models kits – Mega Man, Proto Man, Roll and Zero – later this year. The Kotobukiya kits were officially discontinued in 2013. 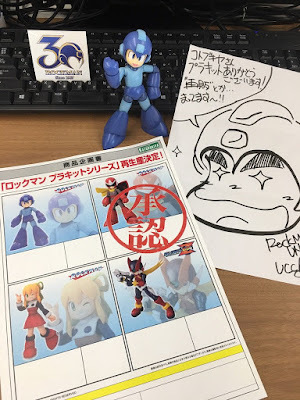 Two years later, the company re-released Mega Man, Roll and Proto Man for a limited period. Although you can easily find these kits today, they don't come cheap. The 2018 reissue will most likely bring prices down to their initial cost (between $25~$35 USD). Be on the lookout. (UPDATE: The kits are slated to ship in February! Mega Man, Roll and Proto Man will go for 3,200 yen (about $28.00) and Zero for 3,600 yen (around $32.00)). Sadly, there's still nothing to be said about the potential for new model kits. But, hey, we can dream. Which characters would you like to see? This makes me happy; these are really great model kits. The "Blues" model is probably my favorite representation of him in plastic to date, and the Zero figure is also just one of my favorite model/toys in general. A lot of people complained about them feeling flimsy, but if you use glue in strategic places during assembly: they hold up pretty well. Anyone that missed these during their first run should pick them up this tie around; they're fun little projects. the arms aren't designed right. gluing would lose possibility. but they do look good. i wish they scaled smaller. My Zero figure had a problem with the arm ball joint. The ball was too big for the joint and I ended up snapping off the skeleton. Though, to be fair, I emailed the company and got a replacement, sanded it down and fixed it right up. Love the snot out of that figure. Obviously you don't use glue in places which would imapact joint articulation. obviously.for me the forearms weren't snug. but then again, models are for display not play, and they do that just fine. @Tcat holy crap, I thought I was the only one who had that same issue with that Zero model. It pissed me off when that ball joint snapped off when I was barely rotating the arm. i too had a shoulder ball joint break on assembly of zero. fortunately i got a replacement sprue from kotobukiya. "My Zero figure had a problem with the arm ball joint. The ball was too big for the joint and I ended up snapping off the skeleton. Though, to be fair, I emailed the company and got a replacement, sanded it down and fixed it right up. Love the snot out of that figure." I'm surprised, because when I said something similar of my Proto Man figure, they said they don't do replacements. I've got plenty of these. They're more than common, unlike the $100+ you pay for D-Arts figures or the elusive non-Battle Network Sentinel figures. We don't need Mega Man's 30th anniversary to remind us of how many figure lines Mega Man Zero has cancelled. That was uncalled for. True but, uncalled for. Yeah we need figure lines to remind us how many companies Volnutt or Vent will make poor by force feeding unsaleable models to the two people that beg online for them to keep pumping out instead. Wished that Bandai would pick the D-Arts/ SH Figuarts line back up more. Still want a Protoman in that style. Koto Mega, Proto, and Roll are nice, but the Zero is where I had problems. Not one, but two Zero models broke in the same spot, the right shoulder joint. The socket was either too small or the ball joint was too big. Tried contacting the company, and didn't even receive a response. models of and paraphernalia has minimal impact on that. capcom gets paid for the license and kotobukiya does the rest. Hardly anyone but the main troupe get figures because those are the figures most people will buy; the deeper into the catalog a manufacturer goes: the more they limit potential sales to the widest possible audience. Bass would be nice, as would Wily or even Dr. Light. that is true, pehaps sentinal could two pack that solution. say a bass and wily. i am game for any more 4inchnel but it feels like that peaked already. I doubt that as they have a variety of characters (robot masters) that wouldnwork in hat scale. Not to mention roll and others. Yo! Thanks for the heads-up, Dude! I already own Rock, thanks to a generous friend, but I've always wanted to own Roll, so being able to get her for the lowest price possible would be great! I just want the animal Based Mavericks from the X series! This. I want high quality figures of the X stage bosses. Boss design has always been a major highlight of the Mega Man titles, and X's has some of the most impressive due to incorporating animals into them. They really need to do this. Already got all four, but it's good to know that these are coming back. Who the hell is Quake Woman? One of the Archie comics-only characters. Unless this is a joke, in which case, I completely understand and even agree. Forte would be nice to complete the trio. I wouldn't be opposed to a Super Armor Megaman either. I bought Megaman Classic last year and I STILL haven't opened it. The more time passes, the more afraid I get of me screwing it up when building it. unless you paint it, dont worry. these things are super easy to build. Hey Brian did the Capcom social media representative who you asked about fan games ghost you? Love to have Model kits based on Ruby-Spears Mega Man. I'd also be cool to get Bass or even the Mega Man Killers. Oh man, a Ruby-Spears Proto Man. What a pipe dream that is, but I'd go for it. More unrealistically, I'd like one for every single robot master. I hope they're selling these at EB Games/Game Stop for $25 or less. That would be a dream come true!